Lifestyle is a stunning Joomla 2.5 Template combining transparency, bold slideshows with a healthy dose of white space. 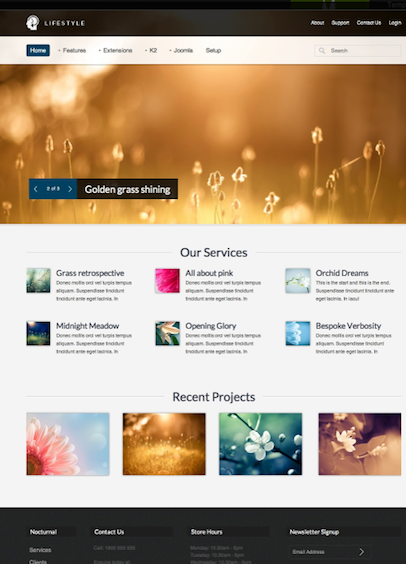 It is a Responsive design that comes with 15 colour schemes. It features support for the brand new Zentools module which when combined with the Zen Grid Framework creates a powerful scaffold for you to build your Joomla website on. This Joomla template can be used to create a Portfolio website to showcase your digital art, a professional business website to showcase your business, or a photography website to display your recent work, and inspiration. There are lots of features of this Template. Click here to see more features about Lifestyle. Bold and large slideshow using Zentools.